Kobayashi Ichizou's first son died young. His second son had been fostered out to the Matsuoka family. However, Ichizou's third son and heir (Kobayashi Yonezou) had no children and so adopted his brother Matsuoka Tatsurou's daughter Yoshimi as his own. Kouhei married Yoshimi and was made Yonezou's heir. 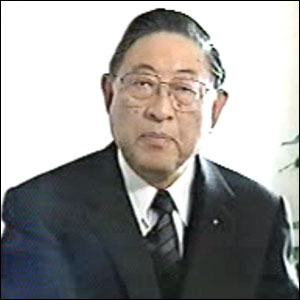 He served as president of the Hankyu Corporation and principal of the Takarazuka Music School, among other things. He was also a writer under the pen name of 公文健. He wrote the script for "The Tale of Coimbra". He came up with the original idea for the play "The Tale of Coimbra". He came up with the original idea for the revue "On the Fifth". He wrote the lyrics for the songs in The Prague Spring. He wrote the lyrics of a song performed in Matsumoto Yuri's first and second recitals. He wrote the lyrics for a song performed in Over the Moon -Tsukikage Hitomi Chronicle-. Created by caithion. Last Modification: Tuesday 19 of February, 2019 10:15:41 PST by caithion.